Breathe deeply and slowly, love is in the air! 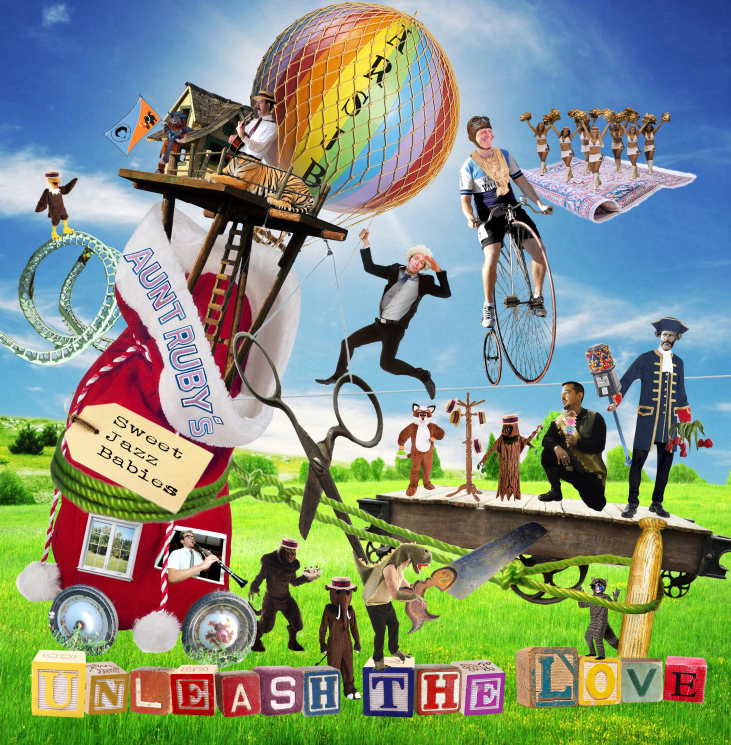 Savor the flavor of romance and wonder with this collection of songs celebrating love’s full dimensions; love found, love lost, lovers in pain, and lovers rejoicing, to name a few. None other than Aunt Ruby’s Sweet Jazz Babies can present this on a golden dance platter and we hope you will enjoy this sophisticated, well seasoned, full course meal. Captured by tyrannous giants on the island of Tyrus and placed into a colossal toy bag, Aunt Ruby’s Sweet Jazz Babies escape the toy bag and bring sunshine to the island’s inhabitants, who then work together with the Babies to construct wheels, scissors, a dance floor, and other apparatus to free the island of gloom and promote dancing, happiness, and prosperity. 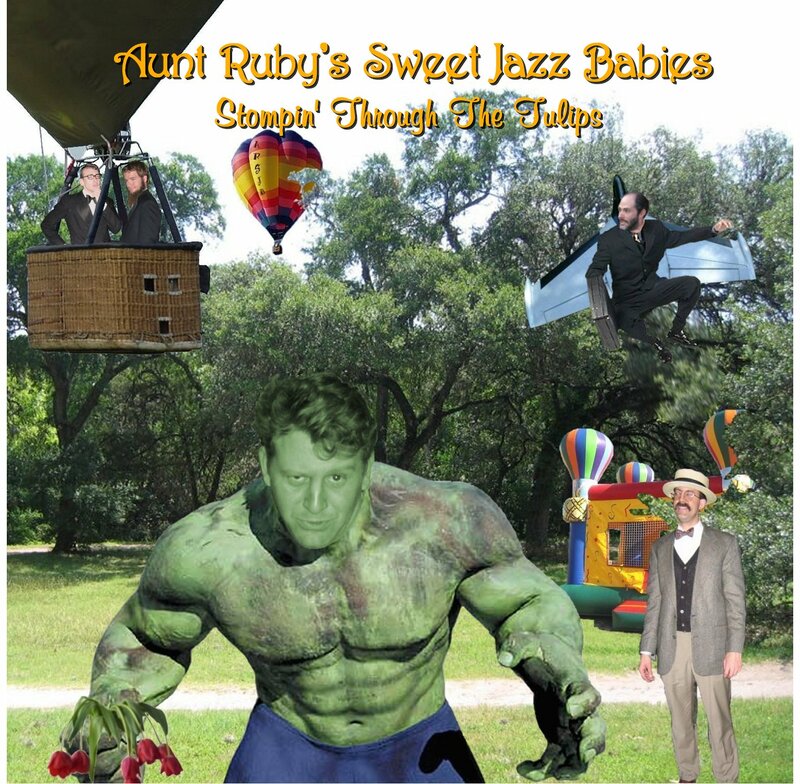 Aunt Ruby’s Sweet Jazz Babies recording entitled “Stompin’ Through The Tulips”, recorded on June 17, 2006, is now available for sale on Compact Disc! 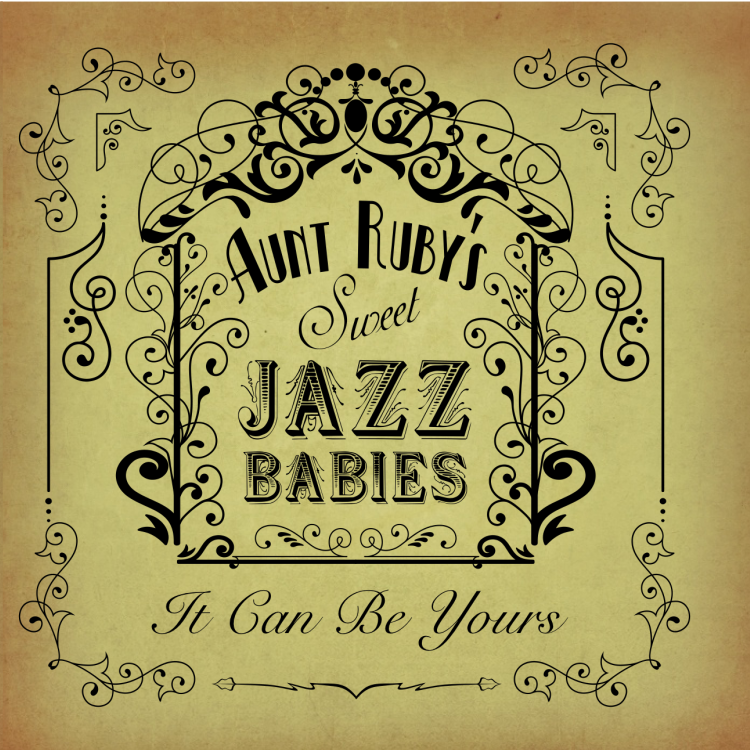 Captured by Coco of the Congo during a public performance in Austin, Texas, Aunt Ruby’s Sweet Jazz Babies were brought to Austin’s Sweatbox Recording Studios to be the unwilling subject of a diabolically evil experiment conceived by a villainous tyrant. Learn how, on more than one occasion, the Babies escape a seemingly certain death at the hands of the evil Coco and his henchmen! Hear for yourself how the Babies perform together as a team. Also included in the CD is a rare public statement from the reclusive Aunt Ruby herself! Parents need not worry for through the wonders of modern technology, the effects of prolonged exposure to hot jazz upon evil-doers have been expertly edited from the live studio recording to maintain the family oriented nature prevalent in all recordings of the Babies. However, evil-doers who listen to this recording and who do not convert to do-gooders have been known to spontaneously combust. Evil-doer buyer beware! For those that are not already familiar with the Babies, sample song clips will be added in the future for your review. 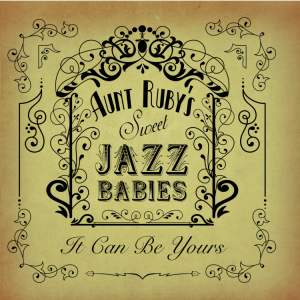 Aunt Ruby’s Sweet Jazz Babies has been diligently working with a number of service companies to offer recordings of the Babies for sale online. 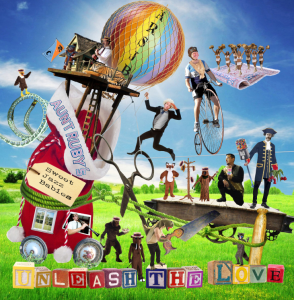 The Babies have partnered with CDBaby and PayPal in order to offer multiple online alternative purchasing options. We hope that you will find the services offered by these companies to your liking. Please be advised that the online purchase price of the recordings are inflated due to increase service charges associated with these companies. If you would rather purchase recordings of the Babies directly from the band using personal check or money order, please read below. Please click on the link located on the right side of this webpage to be redirected to CD Baby to purchase CDs online through CD Baby. Please click on the PayPal “Buy Now” button on the right side of this webpage to be redirected to PayPal to purchase CDs online directly from the band. The sale price of each CD is $15.00. Please refer to the table below for shipping and handling charges. Please allow 10 to 14 days for delivery upon receipt of order. You may e-mail us at arsjb@arsjb.com to ask any questions that you may have prior to ordering. The Babies are presently officially banned in China and North Korea and thus we cannot ship CDs to these countries. Only shipping charges are listed here. Customs, import/export, and all other fees/tariffs/etc. associated with the transmission of products from the United States into your country are not included. You will need to pay all such expenses as applicable. Please know that we will not be able to assist you in determining all of the associated expenses that may apply for your particular country. We encourage you to research prior to ordering.